The growth in value of software-as-a-service (SaaS) companies may not be white hot anymore, but the sector still showed not-too-shabby double-digit growth last year — according to new data that measure enterprise value of tech companies. 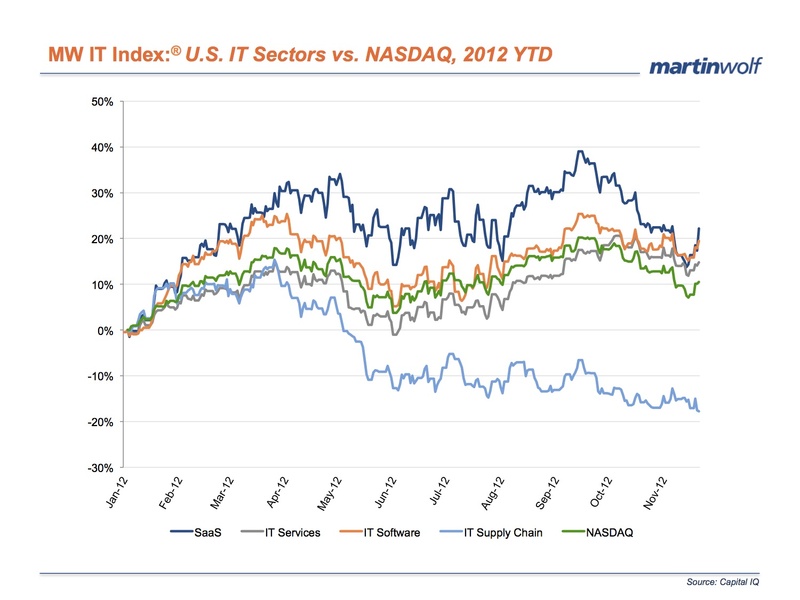 The SaaS numbers for 2012 looked particularly robust compared to enterprise value of traditional IT vendors which are trying to negotiate a tricky transition from hardware providers to more well-rounded IT services companies, said Marty Wolf, president of martinwolf Global M&A Advisors, a company that consults on merger and acquisition strategies. “While SaaS growth has been flat the past six months, it is still up 20 percent year to date. Salesforce.com(s crm) is outpacing the SaaS market—up 20 percent in the last six months and up 50 percent year-to-date. In the same time period,[by contrast] Dell (s dell) and HP (s hpq) have dropped 30 to 40 percent, and year-to-date are down nearly 50 percent from their highs, respectively. Enterprise value factors in market cap plus debt, minority interest and preferred shares minus total cash and cash equivalents and is often used as a measure instead of market capitalization alone. Last year at this time Wolf’s figures showed the SaaS category experiencing white-hot growth with that slowing later in the year. The interesting thing to me is that there still seems to be plenty of upside for SaaS companies. Recent PricewaterhouseCoopers research showed that just 11.2 percent of total software spending by the largest 100 companies in the US was bought via the SaaS or subscription model. The rest came via traditional software licensing. The travails of HP and Dell won’t come as a surprise to industry watchers, but the depths of their quandary is still shocking to those who continue to think of them as the kingpins of the branded PC-and-server era. Both companies have struggled to attain relevance in the cloud computing and mobile device era, with limited success to date. “Tablets and cloud computing are not working to their advantage,” Wolf said. But a picture is worth a thousand words. Check out how SaaS growth stacks up against traditional software companies, IT distribution companies and IT service specialists in the chart below. I’d love to see the difference in growth between large and small SaaS. we monitor the space closely and have seen some interesting trends. 20% year to date growth for SaaS is great. As we move into the new year, the numbers are only going to increase with the rampant adoption of SaaS.